From the impoverished young woman who enchanted nineteenth-century British society as a faux Asian princess, to the sixteen-year-old boy who "stole" a subway train in 1993, to the lonely-but-clever Frank Abagnale of Catch Me If You Can fame, these ten vignettes offer exhilarating insight into mind-blowing masquerades. Graphic panels draw you into the exploits of these pretenders, and meticulously researched details keep you on the edge of your seat. Each scene is presented in the second person, a unique point of view that literally places you inside the faker's mind. With motivations that include survival, delusion, and plain old-fashioned greed, the psychology of deception has never been so fascinating or so close at hand. Praise for Can I See Your I.D.? *Starred Review* [I]mpeccably crafted ... The use of second-person narration is very effective, allowing readers to assume the identities of each individual. Barton's prose captures the daring, ingenuity, and quick thinking required of each imposter. Hoppe's black-and-white line drawings lend a gritty comics quality to each story. ... Thoroughly researched and grippingly presented. *Recommended* The author takes on a suspenseful, energized second-person style and focuses most accounts on a key high-risk moment ... The offbeat, intriguing topic, breezy, accessible style, and compact chapters will sell this to reluctant readers and wide-ranging nonfiction fans alike, and it'd be a gem of a readaloud. Barton's use of the second-person point of view gives these stories dramatic tension and a sense of immediacy. Hoppe's graphic panels enhance this effect. ... Teens in the thick of creating identities themselves will find this riveting. The chapters offer in-the-hot-seat details about these clever-minded imposters. ... The fascinating stories will provide hours of amusement. Young readers who enjoy trickster tales will find this collection of true-life masquerades every bit as delightful. ... These are crazy stories, but true. Barton has collected ... gems and written them with the curious young reader in mind. Other Books Citing Can I See Your I.D.? Bartography: Collected posts about Can I See Your I.D.? 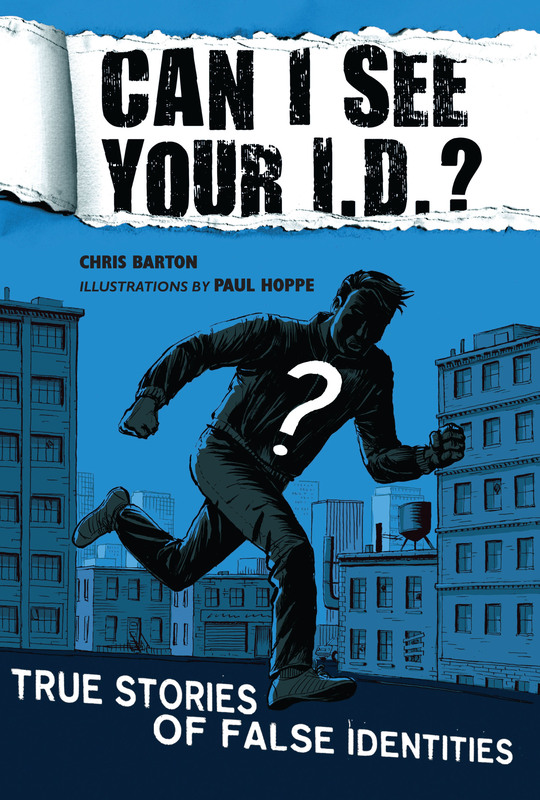 Kathi Appelt: Chris Barton talks about Can I See Your I.D.? Mysteries at the Museum: My appearance on the Travel Channel program discussing "the Great Impostor," Ferdinand Waldo Demara Jr.
Peter Adam Salomon: Can I See Your I.D. ?